For two days only, enjoy 25% off chic styles at Piperlime! I brought this striped number to NYC with me for an easy day-to-night look. Isn’t it adorable? I also have to point out this olive-green vegan leather jacket. Such a great steal for the upcoming fall season! Click here to shop the select styles and just enter code 25LUCKY to save. Get an early start on Memorial Day sales at OTTE NY – they’re offering an additional 20% off all sale styles! This printed Muse top is numero uno on my list. Don’t forget to use code MEMORIAL20 at checkout! Take 25% off all travel wardrobe essentials at J.Crew! Nothing like a good linen tank (comes in 8 colors!!) for a beach vacation or day on the lake. I’m all about metallics in the summer, and these gold strappy sandals are perfect. Finally, this printed dress couldn’t be easier to pack, or cuter to wear. Enter code PACKME at checkout. Great selection, I love that bathing suit. Great picks! Love 5, 6 and 12! 6 and 12 are my favorites – love!! In love with that bathing suit!! So adorable and I love the retro feel! That clutch is so vibrant. Those jeans are perfectly distressed! Also, I have that clutch and love it! obsessed with that necklace and clutch! gorgeous picks as always! In love with that DVF brocade dress! Perfection! Such fun, bright picks! 8 and 12 are my favorites! I just picked up the Chloe book!! I love it =) Those jeans are a great wash for spring/summer! Love them!! I really like the chain necklace. 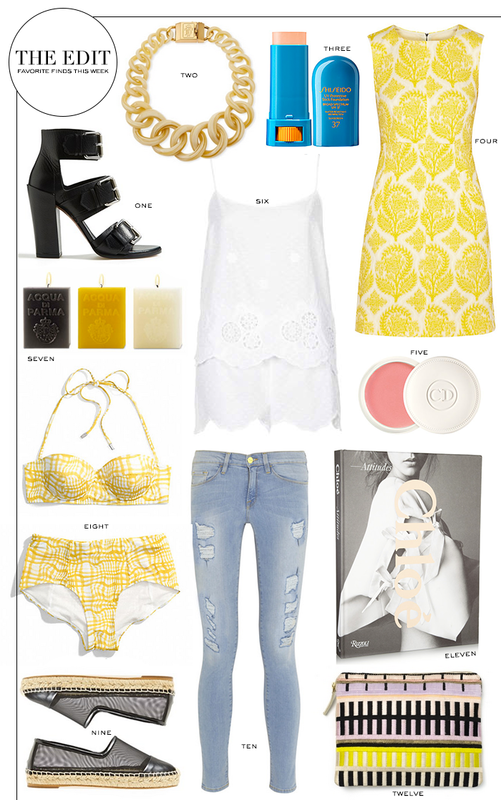 I love all the yellow, white and black hues in these picks. I am usually not much of a yellow person, but I am really drawn to that printed DVF shift dress. It just seems so unique but also something that you could have in your closet for years!